Oliver is no longer in diapers, THANK GOODNESS, but when he was, we loved Pampers when we traveled. As you remember, I was a cloth diapering Mama so we only used sposies when we traveled in the car because, lets face it, cloth is not that convenient for long car rides. 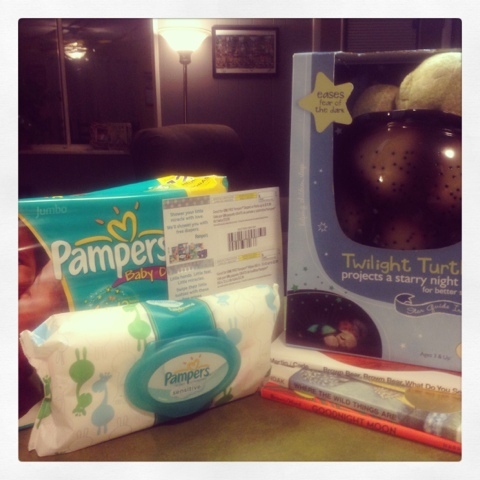 If you're not already a Pampers believer, have no fear. They realize parents are choosy about what they put on their tots bums, that's why they're giving you a chance to win a big pack of love for your own child. Sounds amazing, right? So what are you waiting for?! Scroll down and use the easy Rafflecopter form to enter. Good Luck! I would make them using more natural products that will absorb naturally instead of with chemicals....is there such a thing other than cloth diapers?? make them using less chemical ingredients. Also make them using materials that would degrade faster once thrown out. That's a tough one. I'm usually pretty happy with Pampers. I have a little boy and he seems to saturate the front and it will leak at the waistband because he sleeps on his tummy. I also feel like they're always too long--the back of the diaper seems to stick up at the back of his pants. So, maybe a back piece of elastic?? I would want them to lower their prices but also make overnight leaks non-existent. Thanks for the chance.